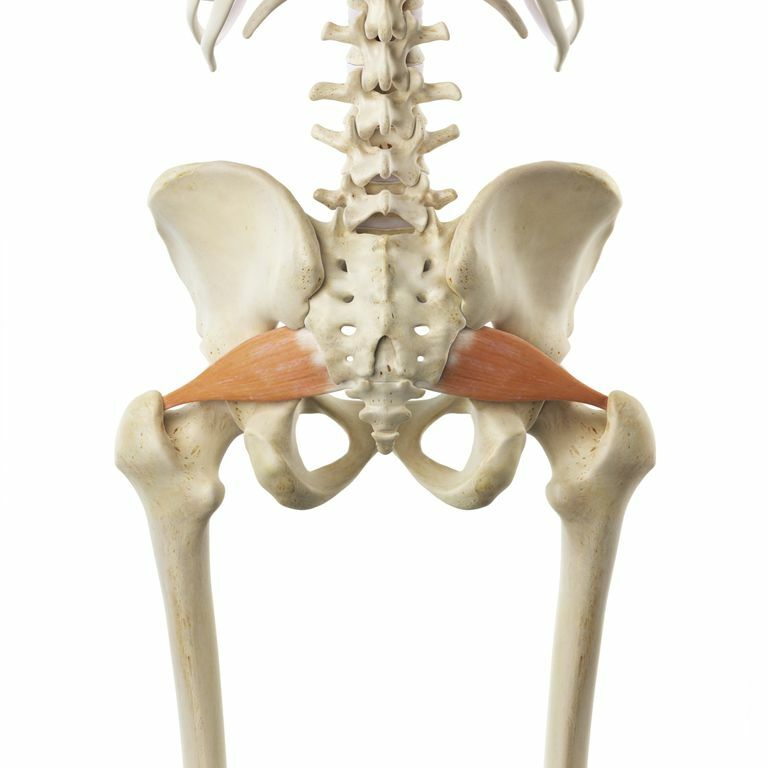 The piriformis is a muscle that is behind the hip joint in the buttocks. The piriformis muscle is small compared to other muscles around the hip and thigh, and it aids in external rotation (turning out) of the hip joint. The piriformis muscle and its tendon have a close relationship to the sciatic nerve--the largest nerve in the body--which supplies the lower extremities with motor and sensory function. The piriformis tendon and sciatic nerve cross each other behind the hip joint, in the deep buttock. Both structures are about one centimeter in diameter. The condition of piriformis syndrome has been described as an irritation of the sciatic nerve from the piriformis muscle. There remains controversy as to whether or not this represents a distinctive diagnostic entity, although it has been described numerous times in the medical literature. When people are diagnosed with piriformis syndrome, it is thought that the piriformis tendon may be tethering the sciatic nerve, and causing an irritation to the nerve. While it has not be proven, the theory supported by many physicians is that when the piriformis muscle and its tendon are too tight, the sciatic nerve is pinched. This may decrease the blood flow to the nerve and irritate the nerve because of pressure. Most people who suspect piriformis syndrome believe that this occurs as a result of anatomic variation of the muscle and tendon. It is thought that in some people, this relationship causes irritation to the nerve leading to symptoms of sciatica. Some people develop symptoms abruptly, while others note the gradual increase in symptoms of the back of their thigh. Most people who are diagnosed with piriformis syndrome are generally active people who have difficulty with certain athletic types of activities as a result of the symptoms of discomfort in the back of their thigh. There are no specific tests that can accurately diagnose piriformis syndrome. Many doctors will obtain studies including MRIs and nerve conduction studies, but these are often normal. Because piriformis syndrome is difficult to diagnose, there are likely many cases of misdiagnosis. This means that some people with the condition don't have piriformis considered as a diagnosis. In addition, some people with vague hip pain may receive this diagnosis even if they don't have the condition. Sometimes referred to as "deep buttock pain," other causes of this type of pain include spine problems (including herniated discs and spinal stenosis), sciatica, and hip bursitis. The diagnosis of piriformis syndrome is often given when all of these diagnoses are eliminated as possible causes of pain. When there is uncertainty of the diagnosis, often an injection is administered in the area of the piriformis muscle. There are different medications that can be injected, but often performing and injection can help determine the specific location of the discomfort. Typically when an injection is given into the piriformis muscle or tendon, this is administered by ultrasound guidance to ensure that the needle is delivering the medication to the correct location. Botulinum Toxin Injection: Injections of botulinum toxin can be performed to paralyze the muscle. In rare circumstances, surgery can be performed to loosen the piriformis tendon, called a piriformis release. This surgical procedure should only be considered when simple treatments have been tried for a minimum of 6 months, and when other common causes of pain have been evaluated. While the surgery is straightforward, it is invasive, and recovery takes several months. Piriformis syndrome is a controversial diagnosis, and some doctors treat this regularly, while others do not believe this exists as a specific diagnostic entity. There are no agreed-upon criteria to establish the diagnosis of piriformis syndrome, and testing for the procedure is generally performed to eliminate other possible diagnoses, rather than to confirm the piriformis syndrome exists. Most treatment protocols are aimed to improve range of motion and flexibility around the hip, with efforts to diminish inflammation around the sciatic nerve. Jankovic D, Peng P, van Zundert A. "Brief review: piriformis syndrome: etiology, diagnosis, and management" Can J Anaesth. 2013 Oct;60(10):1003-12.